Three All-State talents return for Borah, including reigning 5A State Player of the Year Ahmed Ibrahimovic. That combination makes the Lions one of the favorites again this season after coming from behind in thrilling fashion to knock off Post Falls 3-2 in the title match a year ago. In that matchup, Ibrahimovic tallied two goals and an assist. That performance was a microcosm for his impressive 2017 campaign which saw him total 21 goals and 17 assists. With all that is coming back for the Lions, the outlook appears bright. It is also worth noting that a Boise School District team has won each of the last five state championships. 2017 runner-up Post Falls was hit hard by graduation in all areas. Head coach Gabe Lawson will be tasked with replacing goalkeeper Tanner McCliment-Call, defenders Kyle Sanchez and Eli Gregory, midfielder Nicolas Morris, forward Diego Esquivel and multiple other key pieces. Junior forward Ethan Lawson is one of the returning talents for the Trojans that should help keep the squad right in the thick of things on a state-wide level. “This year is a transition year after losing nine seniors. We only have one senior this year in Cadin Perry. I am excited to see how some of our juniors and sophomores react to the changing of the guard and who will step forward to lead this team this year and in the coming years. I am looking forward to building something strong this year to get back and compete at the state level like we did last year and for many years prior,” said Lawson. Along with Perry, the Trojans have plenty of talent to keep things going in the right direction including 2017 Inland Empire League Newcomer of the Year Mckie Gregory as an attacking midfielder and First Team All-IEL selection Ethan Lawson contributing in a similar role. Evan Brinkmeier is an incoming freshman that could make a big impact for Post Falls. “Overall I have a lot of players with a high soccer IQ and high skill. This allows me to really focus on tactics during trainings rather than spending many hours working on technical skills. I think being a very young team is our strength this year, as it will help prepare the players to be ready to compete at the highest level in the years to come. Being young also takes some pressure off of the expectations to be the best like we had last year. It allows us to take risks and not be afraid to make mistakes,” added Lawson. Both Coeur d’Alene and Lake City will be major challengers for the conference crown this season. Multiple schools appear to have core groups in place to make a run on a state-wide level this year including Rocky Mountain, Mountain View, Madison and Boise. Like Borah, Rocky Mountain returns three All-State selections with forward Kyle Jones, midfielder Kristian Quiros and defender Ethan Bengtzen all back for senior seasons. Madison took the consolation trophy last year and lost a lot of talent from that team, however any time you return a goalkeeper of the quality that senior Harrison Feinberg is you have the ability to stay close with just about anybody. “We are stronger this year than last. Our team is generally older and mature. We have been to state, won the consolation bracket and are now looking to improve our accomplishment on the other side of the bracket,” said Madison head coach Dan Dümmar. He has his team focusing on maintaining composure and finishing inside the attacking third. With great team chemistry and talent, that is something he thinks can happen. The rest of the conference has a new look to it with the addition of Thunder Ridge. “Rigby has been getting better each year. Thunder Ridge is a new school in the district, so who knows,” added Dümmar. Mountain View and Boise each made trips to state last season. Both teams fell in trophy matches to conclude 2017, so the groups assembled are hungry to take the next step and bring home some hardware this time around. Midfielders Carter Luthy and Carson Caldwell lead the way for the Braves, while the Mavericks have a nice senior nucleus of midfielders with Mason Grier and Ricky Retana to go along with junior Marcos Vega. Defender Kyle Terashima is another player to watch for Mountain View. Could there be a state title rematch in store for the 4A ranks this year? Defending champion Wood River and runner-up Caldwell are the only teams to return All-State selections from last season, which means the likelihood of seeing one or both of those squads make long runs at state has to be seen as high. For the Wolverines, Defensive Player of the Year Mario Macias is as exciting of a player to watch as it gets from the back line. 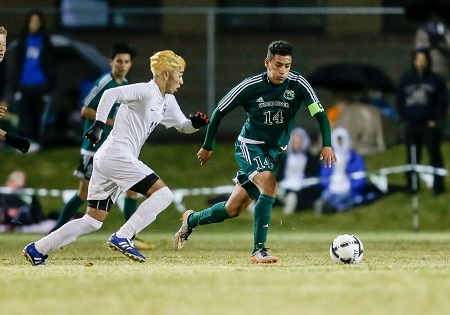 Behind the efforts of Macias and fellow returning teammates Emerson Flores, Brandon Garcia and Javier Vega, Wood River held opponents to less than a goal per contest last season. In the process, the team and returning junior goalkeeper William Penrod shut out nine of the 20 opponents they faced. He mentioned the competitive balance within the Great Basin Conference and also noted that it is important for this team to focus on this year and not the past moving forward. Some other impact returners for the Wolverines include Jossett Guzman, Jovany Armenta and Lucas Beste. Guzman and Armenta were First Team All-State selections last year, while Beste earned All-League accolades. An influx of young talent should help as well. “Great freshman class with lots of talent and some great JV players moving up to become varsity players,” added Monjaras. Caldwell has First Team All-State midfielder Adrian Arguello and goalkeeper Jevon Olvera in place to lead the way for the Cougars. Also returning are All-Conference selections Javier Rodriguez, Carlos Lechuga and Damien Arguello. With all of that talent on board for the top two teams from last season, the question becomes, who can step up and challenge for the top spot? Hillcrest is a school that moves down from 5A that could make things interesting. The Knights graduated 5A District 5/6 Player of the Year Seth Redd from the forward position and goalkeeper Ethan Hatch, but the team has to be optimistic with talent like Caleb Speirs and Jose Martinez in place. The team took third place in the 5A ranks last season. The Knights will be challenged within the conference by state teams from a year ago in Blackfoot and Idaho Falls. 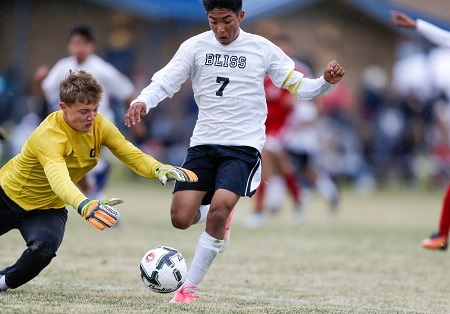 Blackfoot will have a tough task after losing ten seniors from their roster, while Idaho Falls appears to be ready to make another run with midfield duo Demitri Fried Ochoa and Kyle Fogg back for their senior seasons. Up north, Sandpoint did not lose any of its conference matches a year ago, with a tie against Moscow the only thing keeping the Bulldogs undefeated in that slate. In total, Sandpoint outscored the Bears and Lakeland 16-2 in the 2017 campaign. Things might be a little more up for grabs this season with the defending champs having lost 4A Inland Empire League MVP Tanner Kohal and 11 other seniors to graduation. Ridgevue was the third-place team at state last season and has to replace 4A SIC Player of the Year Lupe Barajas and multiple other key contributors that have helped build the Warhawks into a contender in the first two years of the program. Expect the group to find a way to fill some of the gaps and still be a challenger within the conference and on a state-wide level this season. It was one of the wilder 3A state tournaments in recent memory last year, with all day one contests decided by a goal and five of the 11 matches throughout the tournament coming down to either overtime or a shootout. Weiser took home the championship hardware after a thrilling trio of matches at state. The Wolverines defeated Bonners Ferry 4-3 in overtime to get things started, topped Community School 1-0 in a shootout in the semifinals and then knocked off the Bliss Bears 2-1 to win it all. The best part of it all for Weiser? First Team All-State goalkeeper Dylan Miranda was only a freshman. Having the quality net-guardsman back for his sophomore campaign is an exciting thing for the program. Head coach Kathy Bokides and the Wolverines have won two of the last three 3A state titles, so they should be right in the thick of things again this year. As evidenced by all the close state tournament matches, a vast assortment of programs are capable of making their own runs this time around. Community School returns more of its roster than any other team that made the state tournament a year ago, losing just two seniors to graduation. Junior forward Cash Dart will be an exciting player to watch for the Cutthroats and head coach Richard Whitelaw. Midfielder Shea Brokaw and defender Henry Cherp are also back after taking All-Conference honors last fall. Within the same conference, 2017 runner-up Bliss lost multiple All-Conference selections. Forward Steven Rubio and All-State defender Saul Valencia do return however, with the now-seniors looking forward to the added leadership responsibilities that should now be available. In the east, Sugar-Salem is a team that has the potential to make a lot of noise this year under 15th year head coach Oscar Bustos. Spencer Dayley, Jordan Dayley, Asa Hatch, Rylan Bean, Scott Galbraith and Luke Terry were each selected as All-Conference talents last year and are all returning. Bean is the goalkeeper, with Hatch and Terry some of the stoppers in front of him. The other pieces all have the ability to get the goal in the net to keep the opposition from zoning in on one particular scoring threat. “We lost five strong seniors from last year, but this young team probably has more individual skill than last year’s team. We scored a lot of goals last season (105), but we didn’t win when it counted at state. Hopefully this year’s team learned from that and can stay consistent all season,” added Dayley. He mentioned Teton as a team that has been strong the last few years in the Mountain Rivers Conference and South Fremont as a dangerous group as well. Timberlake had the 3A State Player of the Year in Denton Meijerink last year, but was not able to make a trip to state in his junior season. The White Tigers will be hungry to change that this year, with things looking fairly wide-open amongst the district one and district two teams. Bonners Ferry was the lone state representative last year. Orofino returns First Team All-State midfielder Nate Drobish to the pitch, but will have a lot of work to do on the defensive end of things after giving up three goals or more in eight matches last season.